Of all Yosemite’s lodging options, the Majestic Yosemite Hotel (formerly the Ahwahnee Hotel) stands out not only for its location—you can see Yosemite Falls from the legendary dining room—but also for its interior, redolent of Yosemite’s early years. And you don’t need to book a room to enjoy this National Historic Landmark. Visitors to Yosemite National Park who forego a room at this luxury hotel still have plenty of options for experiencing its grandeur. Perhaps the most popular is a meal in the spectacular dining room, open for breakfast, lunch, dinner, and Sunday brunch. Some guided tours of the national park include a dining room meal or fireside storytelling in the hotel. Free historic tours take visitors through the rooms, halls, and grounds to learn more about its storied past. The Majestic Yosemite Hotel is a must-see for history buffs and first-time visitors to the park. Tour and dining room reservations fill up early, so be sure to book well in advance. Bring your camera, as the interior and exterior views are shot-worthy. The hotel is accessible to wheelchairs and strollers. If you’re not part of a guided tour, the easiest way to reach the hotel is to drive or ride your bike. It’s also a stop on the free year-round Yosemite Valley Shuttle System, departing from the Yosemite Village parking area and other spots around the park. 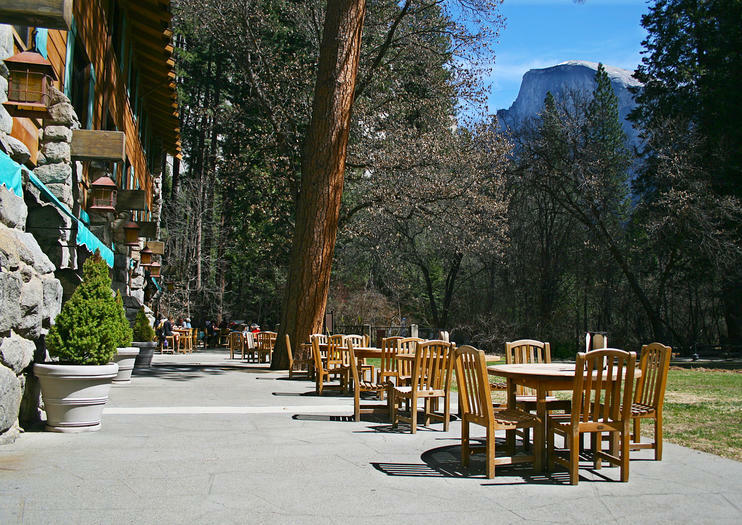 The Majestic Yosemite Hotel and dining room are open throughout the year. One of the best times for a meal is during the popular Sunday brunch, though it’s a good idea to book in the offseason to avoid the summer crowds. In an effort to attract more affluent visitors to the park, this historic hotel was commissioned in the 1920s. Some 5,000 tons (4,536 metric tons) of stone, 30,000 feet (9,144 meters) of lumber, and 1,000 tons (907 metric tons) of steel were brought in for construction. The design takes inspiration from art deco, Native American, and Middle Eastern cultures, with details like stained glass windows, hand-woven tapestries, and hand-stenciled ceiling beams. Explore Yosemite and Glacier Point on a full-day trip with a small group. Catch views over the entire Yosemite Valley, Yosemite Falls, and Half Dome at Glacier Point, before continuing on a hiking or driving tour. Hotel, airport, or bus/train station pickup is included, in addition to lunch at the Ahwahnee Hotel (except Sundays). As this tour is designed for a very small group, chances are if you have four or more people in your party you may get a private tour. Discover the wild beauty of Yosemite National Park during wintertime, when crowds are fewer and the majestic natural attractions are blanketed in snow and ice. On this 2-day trip from San Francisco, take a guided coach tour of Yosemite Valley and enjoy free time to explore the wintry wonderland. Hike or snowshoe through giant sequoia groves, ice skate near the base of Half Dome and admire the snow-capped Sierra Nevada scenery. Warm up by a fire in Curry Village, and tuck into the cozy Yosemite Lodge by the Falls on one of the Yosemite Half Dome Village Heated Tent Cabins for the night.